My friend and I teamed up to kill the female titan. I planned something so we could kill it. I would like to share our strategy with you guys. Set the map to Annie II. Annie I is not recommended for this strategy. Set the time to any minutes you want, but not less than 10 minutes. You do know the weak points of the Female Titan, right? Okay, you're good to go. EX: You sliced the nape with 150 damage, now you need 850 damage more to kill it. In order to kill the Female Titan faster, you should slice her nape with high scores. 1-2 player(s) will be targetting the female titan's weak points, while the other player(s) will become a bait, or wait until the Female Titan weakens and kneel down. The other player(s) goal is to survive and be alive. Now, after the Female Titan kneels, the other player(s) can now slice her nape. The players targetting the weak points can also too. (This is the best option I can give so you can easily kill her.) Just like what I said, you need 1000+ total damage to the nape so she could die. Now, if one of you dies, the other(s) should survive. Look left, right, behind, front. Use your 3DMG skills professionally and efficiently. If they die while you haven't respawned, then Humanity fails, and resets your game again. 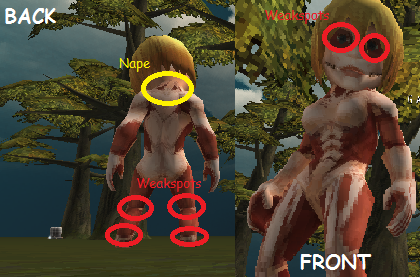 (This will also reset the damage dealt to the Female Titan's nape, so be careful.) Once she dies, she'll scream, it'll spawn titans to eat her body, and will also kill you. Better not distract them while eating the Female Titan's body! Last edited by WeiUberstriker on Mon Dec 23, 2013 10:22 am, edited 2 times in total. That's some pretty high ankle damage you got. As to where this topic should be. Probably in the tutorial section. Of course, a topic similar to this one is already in the tutorial section. 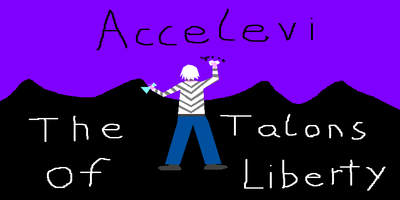 So I don't know what the moderators or Accelevi will do. But you're tutorial is quite profession. So kudos to that. Moved to the tutorial section. This tutorial is nice, but Annie I forces you to be more careful whereas II can just let you go kamikaze.